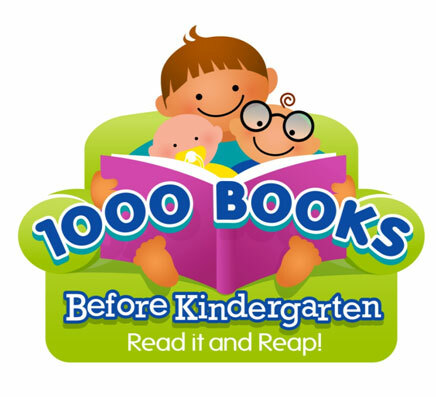 1000 Books Before Kindergarten is an ongoing program based upon evidence that the more children (ages 0 – 5) hear books read to them, the more prepared they will be to learn and enjoy reading upon reaching Kindergarten. The Benefits of Reading to Your Child: Research shows that children with larger vocabularies are better readers. Knowing many words helps children recognize written words and understand what they mean. Vocabulary is learned from books more than from normal conversations with adults or other children or from the TV. Children will gain Narrative & Story Telling skills that will help children better understand what they are reading. Being able to rhyme and sing will give your child a Phonological Awareness that will help them as they begin to sound out words when learning to read. By helping your child gain Letter Awareness, knowing the names and sounds of letters, children learn how to sound out words themselves. And most importantly, Children who enjoy shared reading time, and see others around them enjoying reading will want to learn how to read. Any child from birth until he or she enters kindergarten can participate in the program. Listening to stories during Story Time counts towards books read, asks staff members for our Story Time hours or visit our Calendar of Events (http://ccld.lib.ny.us/). Studies have shown that families who start reading aloud to their children at birth help to strengthen their language skills and build their vocabulary – two important tools for beginning to learn to read when they enter kindergarten. Register – At the Horseheads Free Library, the Big Flats Library or the Steele Memorial Library and take home your first reading log. Track Your Reading – Each time you read a book with your child, fill in a circle on the reading log. Show us Your Reading Logs – When you reach 100 books, bring in your reading log, and at each 100-books mark, you get a “100 books!” sticker. Read More Books! When you get all the way to 1000, you’ll receive a lunch box for Kindergarten! For more information or to download our convenient reading logs (or use our iPhone or Android App) and our recommended reading list visit 1000booksbeforekindergarten.org. Horseheads Free Library is hosting their annual 1000 Books Before Kindergarten kickoff Storytime on Tuesday August 30th at 10:30.
first reading log, listen to stories, rhymes and make a craft. Celebrate kids who have reached the 1000 book goal! Books with simple, large pictures or designs with bright colors. Images should be of familiar objects, or other babies. Small, stiff Cardboard, Board Books made for small hands. Washable cloth books to cuddle and mouth & Plastic/Vinyl books for bath time. Sturdy books they can handle and carry. Books with photos of children doing familiar things like sleeping, eating or playing. Books with only a few words on each page, with simple rhymes and predictable text. Books that tell simple stories. Books with rhymes, rhythms, and repetitions they can learn by heart. Food, Animals, Vehicles and Bedtime books are favorite subjects. Books about saying Hello and Goodbye. Books about kids who look and live like them, as well as books about kids living in different places. Books about counting, ABCs, shapes or sizes. This program is graciously funded by the Friends of the Horseheads Free Library. This entry was posted in Uncategorized, Youth Services and tagged 1000 Books Before Kindergarten, literacy, reading by ccld. Bookmark the permalink. ← Previous Previous post: Take a Computer Class! Next → Next post: Find Time to Color!